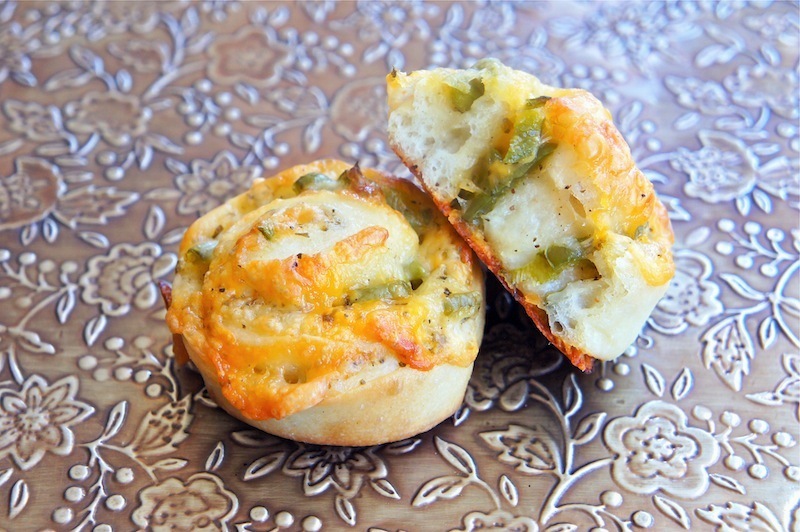 These are tasty little Jalapeno Cheese Bites. Made with pizza dough that's filled with Tex-Mex cheese blend, and some lightly blanched Jalapeno peppers. 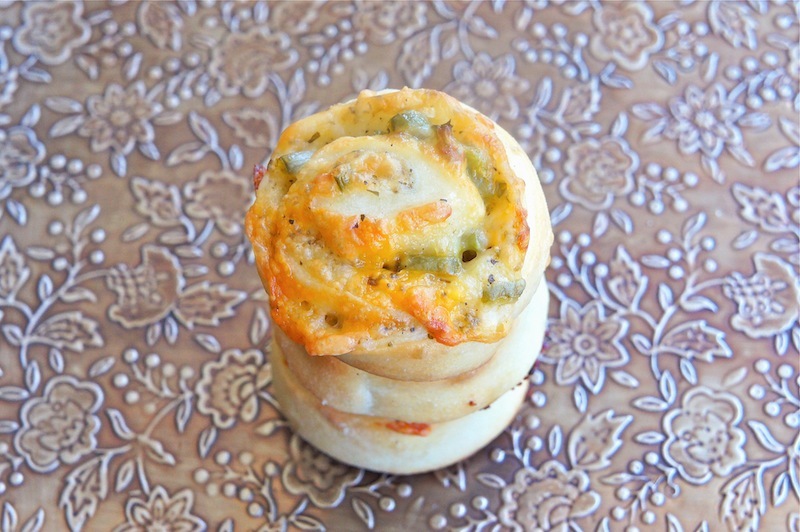 The rolls are slightly spicy with gooey cheese melts. Great snack. Press down the dough on a lightly flour surface. Then pull and stretch the dough into a rectangular shape. Spread the oil onto the dough, and gently press it into 14 by 8 inches rectangle. Then sprinkle some sea salt, mixed herbs, ground black pepper, and scatter the cheese, and Jalapeno peppers. Roll up the dough as tightly as you can. Pinch both ends, and slice the log into ¾ to 1-inch rounds. Place the rolls on the baking sheet, cut side up, and bake for about 18 to 20 minutes, or until the cheese has melted, and light golden brown in color. i am salivating like crazy!! Next time I make pizza, I'm going to throw a few of these together for my husband. He's going to wonder what he did to deserve such a great little treat. oh, wow! the most beautiful jalapeños were at the store the other day, now I wish I'd bought some. thanks for this! Done and done. Making them this weekend! Angie, these look great! I just wondered if there was a reason you preferred to blanch the jalapenos? It wouldn't have occurred to me, so I'm curious. I've got fresh chives and parsley in the garden so I'm going to using them in this tasty-sounding recipe. @Anonymous: The blanched Jalapeno works better. It remains moist after baking. Hmmm, I always have jalapeno's in the freezer, and am having a bunch of people over tonight, so I guess I'll try this. Looks good. How cute! My husband would love these so much! My husband made these last night and they were great! Thanks for the recipe-- it's a keeper!